"She is careful, she is measured, she is serious," Cruz said. "She doesn't get overly excited, she doesn't get rattled by whatever is thrown at her." The Texas senator acknowledged that it's unusual to make such an announcement so early, especially before July's Republican National Convention in Cleveland. "Where we are right now: Nobody is getting to 1,237 delegates. I'm not getting to 1,237 delegates and Donald J. Trump is not getting to 1,237 delegates and the Hoosier state is going to have a powerful voice," Cruz said. He said he's making the announcement now so that voters in states that have not yet held their primaries know what they will get. "You deserve to have a candidate who doesn't change to where the wind blows at the moment. You deserve to know exactly where a candidate stands." 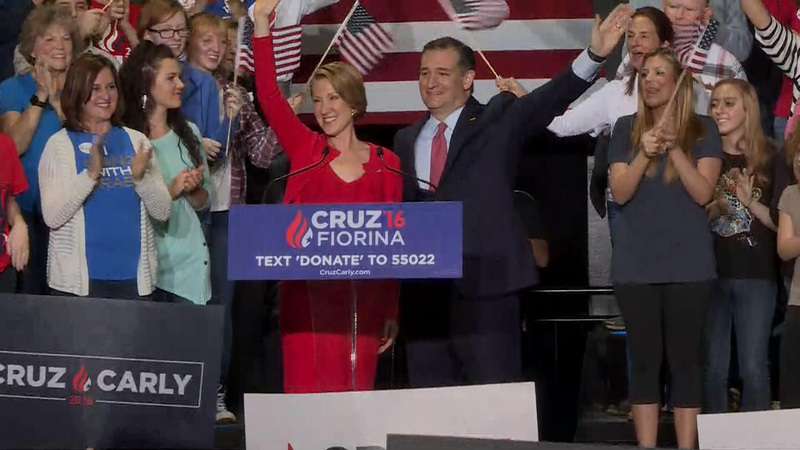 Fiorina said she was "very proud, very humbled and honored" to accept Cruz's offer. She said that Trump and Hillary Clinton would both be "disastrous for this nation." "Donald Trump and Hillary Clinton are two sides of the same coin," she said. "They're both liberal. We know that." Fiorina then began singing a song from the podium to Cruz's daughters. "I know two girls who I just adore. I'm so happy I can see them more. 'Cuz we travel on the bus all day, we get to play, we get to play," she sang. Cruz said Carly often makes up songs to sing to his daughters Caroline and Catherine and texts with them with "heart and smiley-faced emoticons." Fiorina endorsed Cruz last month. Cruz has decided to team up with John Kasich to try and block Donald Trump from receiving the GOP nomination. But the announcement comes a day after Donald Trump expanded his primary lead in the path to the nomination, sweeping all five states that held primaries on Tuesday. According to CBS News' latest count, Trump has 949 delegates, Cruz has 556 and Kasich has 152. A candidate needs 1,237 in order to win the GOP nomination.